Most people know that Lexington, Kentucky, is the "Horse Capital of the World" but what they may not know is that the great Thoroughbred stallion also named Lexington (in honor of the city of his birth) is credited with helping gain and solidify this title for the Bluegrass. On the morning of March 17, 1850, Dr. Elisha Warfield was summoned to his barn at The Meadows farm (once located within the city limits of Lexington) to see a new foal. Darley was the name originally given by Warfield to the bay colt by Boston out of his top racemare Alice Carneal. Dr. Warfield received his medical degree from Transylvania University in downtown Lexington. He had a medical practice and was a Professor of Surgery and Obstetrics at Transylvania. When Mary Todd Lincoln&apos;s mother Eliza Todd became ill with childbed fever upon the birth of George Rodgers Clark Todd, Dr. Warfield was one of the area doctors called to attend to her. Darley did not run his first race until the age of three. Dr. Warfield was seventy-two at the time and his physician and his wife, concerned for his health, had ruled him off the Turf. Determined to stay involved in the industry, he leased Darley&apos;s racing qualities to his African American trainer, Henry Brown. No black man, free or slave, could race a horse in his name then, so Darley carried Dr. Warfield&apos;s colors (light blue cap, white jacket) and Dr. Warfield put up half the entrance fee for his first start on May 23, 1853. The field was on edge at the starting line, possibly due to muddy conditions, and the Boston colt was one of several that bolted before the start. Despite already running over two miles before the official break, Darley led from flagfall to finish in both the first and second heats, leaving a remarkable first impression. This performance did not go unnoticed by Richard Ten Broeck (primary owner of the Metairie Course of New Orleans) who made an agreement on behalf of a syndicate to purchase the colt for $5,000, and later bought the horse outright. He gave the horse a new name: Lexington. After six wins in seven events and earnings of $56,600, Lexington retired from the track as the third greatest money-earner up to that time. He was rapidly going blind, as his sire had before him, and there was nothing left for him to prove on the track. Lexington was the fastest runner of his time, but more important: he was the greatest sire of his time, producing more champion offspring than any other stallion. Beginning in 1861 he led America&apos;s sire list 14 consecutive years until he died in 1875 and then headed the list twice more posthumously. That&apos;s 16 years in all-a record that still holds today. 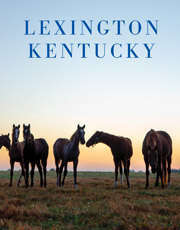 Richard Ten Broeck arranged for Lexington to enter stud at John Harper&apos;s Nantura Stud near Midway, Kentucky and the horse stood there for two years until purchased by a neighbor, Robert A. Alexander, of Woodburn Farm, just up the Old Frankfort Pike. Over the next 25 years, many of the best racehorses in America came from the pastures of that farm, most of them descending from Lexington. Lexington left Woodburn only twice. In 1859 he was sent to St. Louis for the exhibition at the Great St. Louis Fair, and in 1865 when he was sent to Illinois during the Civil War. Lexington sired some 600 foals, over one-third of which were winners. Combined they earned $1,159,321. Considering most of these were racing during the Civil War when purses were small, this is phenomenal. 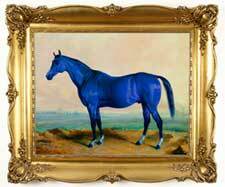 This revered horse passed away on July 1, 1875. A few months later he was exhumed and taken to Washington D.C. where the skeleton of the great Lexington became Catalogue No.16020 at the Smithsonian Institution. He was rarely displayed. At long last, in 2010, he was returned home and is now on display at the International Museum of the Horse at the Kentucky Horse Park. Edward Troye&apos;s classic portrait of Lexington was the inspiration behind Lexington&apos;s blue horse that adorns wayfinding signs around the city, and the inspiration behind the logo used by VistLEX, the convention and visitors bureau for Lexington. Go on a Big Lex Scavenger Hunt!